When US President Donald Trump’s son landed in India on February 20, an advertisement that appeared in many national dailies, asked: ‘Trump has arrived. 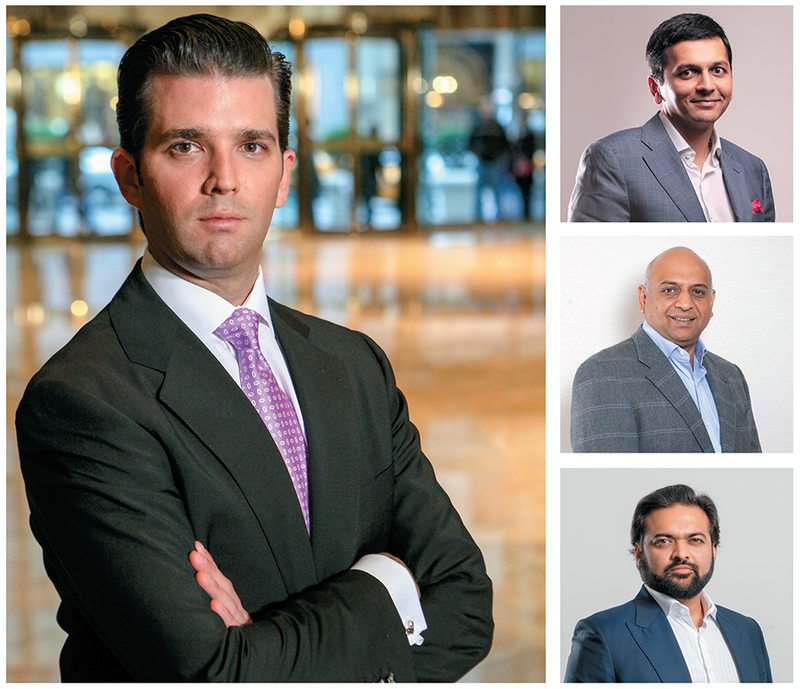 Have you?’ The word play was not restricted to Donald Trump Jr’s visit to meet business partners and customers, but also hinted at the arrival of the Trump Towers brand in India. 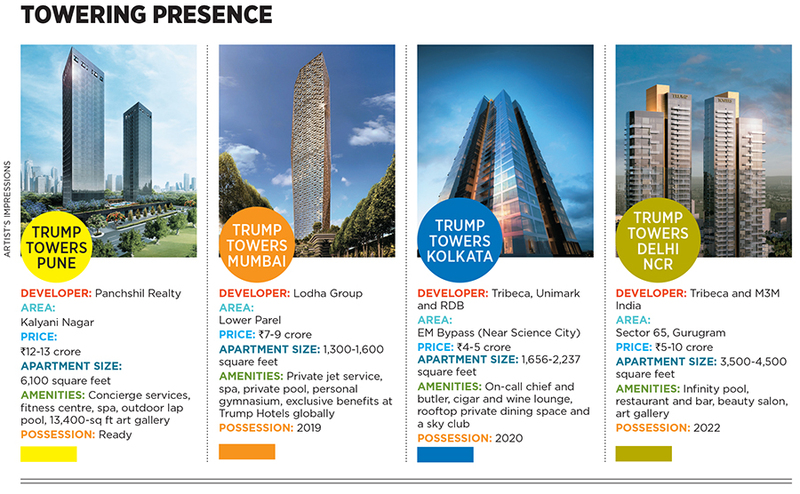 With four marquee residential real estate assets and one commercial property in the works (See Towering Presence), India will have the largest number of Trump-branded properties outside North America, once completed. Prior to becoming president, Trump, 71, had made a name for himself as a businessman who established The Trump Organization as a globally-renowned luxury real estate brand. However, his entrepreneurial success led to questions over a potential conflict of interest given the public post that he holds. Trump has sought to distance himself from his business by handing over the management to his sons, Trump Jr, who is executive director, and Eric Trump. Trump’s India partners also insist that the ongoing conflict-of-interest debate in the US has had no bearing with the deals signed by The Trump Organization here. They see the deals, signed before Trump became president, as a golden opportunity to develop luxury residences under the Trump Towers brand licensed from The Trump Organization. The partners’ enthusiasm is understandable. According to international property consulting firm Knight Frank’s latest Global Wealth Report, the population of the ultra-rich (with net assets of $50 million or more) in India grew a staggering 54 percent between 2012 and 2017, to around 2,920 individuals. Trump Jr, too, is excited with his India story and the people he has chosen to partner with in the country. “We’ve enjoyed incredible success in India over the years and are proud to now have five developments in this important market. That doesn’t happen overnight and was a result of hard work and time on the ground meeting with the very best in industry,” he wrote in an email to Forbes India. “There is tremendous demand in the luxury sector and it is extremely rewarding to see our projects fulfilling that demand and at the same time, exceeding all expectations in terms of luxury, quality and service.” He was also happy with the outcome of his recent visit. “I’ve been to India many times before, but this past trip was probably one of the most exciting and personally fulfilling. To see progress and visit with the amazing teams that are executing and bringing to life the goals we set together many years ago was really special,” writes Trump Jr.
Anshuman Magazine, chairman, India and South Asia, at property consulting firm CBRE, says the culture in India is such that when an individual or a family adds meaningfully to its wealth, the first thing they splurge on is upgrading their living space. With intense pressure on land in urban centres, lavish residences in the sky are the new normal in India. Such branded, serviced apartments are common in global cities such as London, New York and Dubai but here, they have been developed on a piecemeal basis. The Trump brand wants to fill that space. 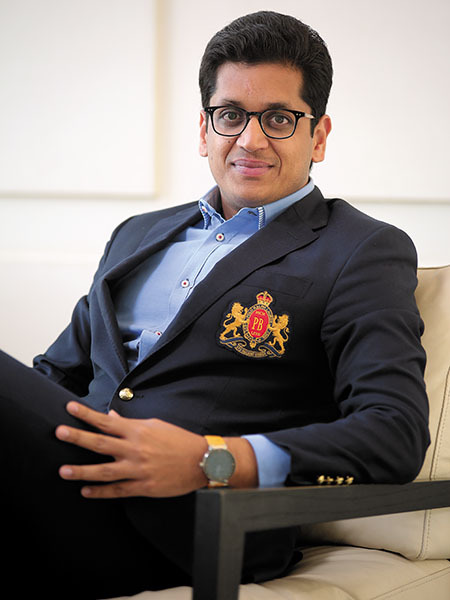 The Trump Organization has identified Mehta, 39, a first-generation entrepreneur and founder of Tribeca Developers, to build its brand in India. Mumbai-based Mehta belongs to a family of architects and veered towards the real estate industry ever since he remembers. After completing his bachelor of arts in computer science from the University of Texas in 2000 and MBA from the Wharton School at the University of Pennsylvania (the alma mater of Trump, Trump Jr, and several other executives of The Trump Organization) in 2006, Mehta had stints with two private equity firms—the Carlyle Group Real Estate Private Equity in New York and Lehman Brothers Real Estate Private Equity Fund in Mumbai. 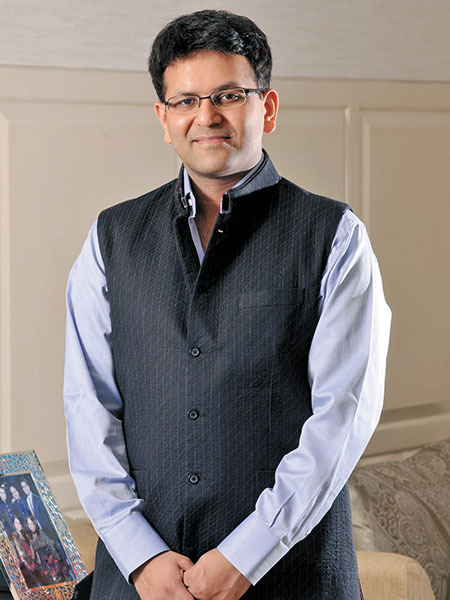 While at Lehman, Mehta came in contact with the Trump family through some common Wharton connections, and developed a close bond with Trump Jr. After raising fresh capital became impossible in the wake of the collapse of Lehman Brothers in 2008, Mehta began working for Rohan Lifescapes, a Mumbai-based realty developer. It was around this time that The Trump Organization was looking at India as a potential market. Mehta was instrumental in initiating a dialogue between the organisation and Rohan Lifescapes, which culminated into an agreement and the latter agreed to develop India’s first Trump Tower at Girgaum in South Mumbai. Due to regulatory issues, the project fell through in 2013. Later when Mehta decided to venture out on his own with Tribeca, The Trump Organization gave him the exclusive rights to grow the brand in the country. “I had lived and worked in New York (where the Trumps were based) and understood their business language. We went to the same school and our professors encouraged a match. They saw me as someone who could bridge the gap between the US and India,” Mehta tells Forbes India. He then tried to gauge the suitability and interest of real estate developers in India in affiliating with Trump. The first couple of deals included licensing the brand out to developers such as Pune-based Panchshil Realty and Mumbai-based Lodha Group, both of whom are now building their own residential Trump Towers in their respective cities. The next two deals saw Tribeca put its own skin in the game by becoming an equity partner in the development of the Trump Towers in Gurugram (with M3M India) and Kolkata (with Unimark and RDB). The four properties have a collective sales potential of around $1.5 billion. Amid a bevy of other real estate developments in the emerging IT and manufacturing hub of Pune, stands a pair of imposing towers fashioned in black glass in contrast to the azure sky. On the façade of the common podium at the base of the two 23-storey towers (each floor houses a single 6,100 sq ft apartment), the words ‘Trump Towers’ are emblazoned in gold. They’re the first Trump Towers in India, developed by Panchshil Realty, with ready-to-move-in apartments. According to property portal 99acres.com, a five-bedroom apartment in the high-rise is selling at ₹13 crore. Among the buyers are the father-son duo of actors Rishi Kapoor and Ranbir Kapoor; Sanjay Ghodawat, promoter of the eponymous business group; and the Firodia family, promoters of Force Motors. Atul Chordia, chairman of Panchshil Realty, says developing branded residences like the Trump Towers is an attractive bet for real estate players. Apartments at the Trump Towers in Pune’s upscale Kalyani Nagar area have been selling at 30 percent above the prevailing market price. Panchshil has sold all the 22 units, except the show flat, in the first tower, which was launched in 2014, says Chordia. It has also sold five of the 23 units in the second wing, which was launched when Trump Jr was in India earlier this year. “Trump has been an iconic brand in luxury real estate globally for several years. It has a halo effect, and if you can tag a good product along with a good brand, it is easy to market it and get the right price,” says Chordia. Around 160 km from Pune, another Trump Tower is coming up in the central business district of Lower Parel in Mumbai. Once ready, the 78-storey building, developed by the Lodha Group, will boast a shimmering golden façade with the rising sun gleaming right off it. In addition to the customary concierge and hospitality services that one expects at such five-star residences, Lodha is offering its future residents a private jet service to a destination of their choice. “Residents will get a certain number of hours for which they can avail the jet service for free, after which it will be pay-per-use,” says Abhishek Lodha, MD of the Lodha Group. While the response in Mumbai and Pune was on expected lines given the deep pockets prevalent in the two cities, the interest in Kolkata came as a surprise. Around 70 percent of the 135 units available in the Trump Towers Kolkata—launched in November 2017—were sold out in just two months. This demonstrates that if the product is designed and priced appropriately, there may be a case for branded residences to exist outside Delhi and Mumbai. Though the specifications and amenities available at Trump Towers Kolkata meet global standards, the apartment sizes start at 2,500 sq ft, which has brought down the prices to ₹4.5-5 crore. “Despite Kolkata having the third highest number of ultra HNIs in India, there weren’t enough offerings in the super-luxury space,” says Kumar Patodia, director of Unimark, which is developing the property, in an email. Anuj Puri, chairman of ANAROCK Property Consultants, believes that the Trump-branded projects in Gurugram and Kolkata have benefited from Trump’s presidency. 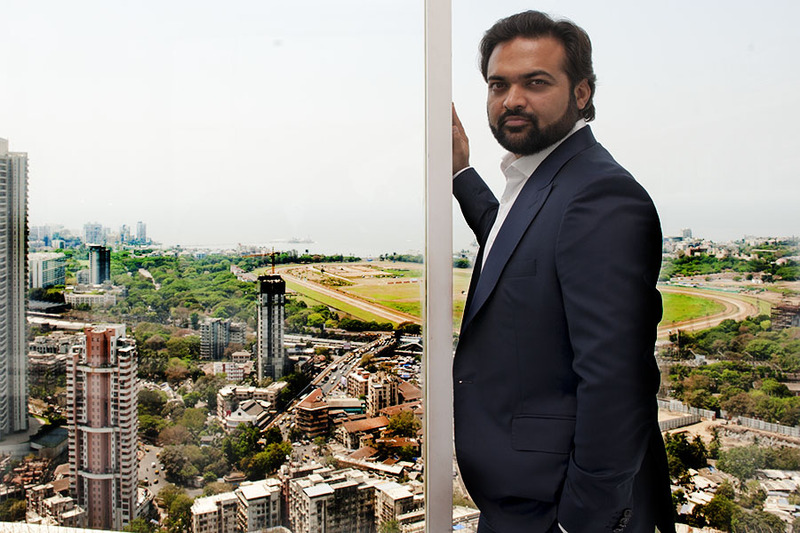 “These two projects were launched after Trump became president and their initial sales velocity has been higher than what it was for the Trump Towers in Pune and Mumbai,” says Puri, former head of global real estate services firm JLL in India. Donald Trump, who has a net worth of $3.1 billion according to Forbes’s 2018 The World’s Billionaires list has emerged as one of the most polarising figures in the US. However, that does not seem to have affected his business interests in India. A senior executive of a real estate company that has partnered with Trump in India says some who don’t believe in Trump’s brand of politics stay away from the launches of Trump Towers in the country, but most turn up owing to the brand value and promise. There are no new branded developments planned in the next three (when Trump’s term as president ends) to seven years (if he runs successfully for office again). But there are indications of a growing appetite for more Trump Towers in India.